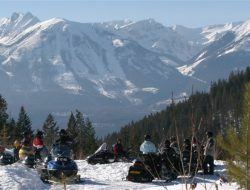 These tours offer guided snowmobile tours in the Canadian Rockies. You will be shuttled through the majestic Rockies from Canmore, Banff, and Lake Louise. The closest snowmobile operation is 84 minutes from Banff and 50 minutes from Lake Louise – they are located just west of Yoho National Park outside of the National Parks. All the trips provide all the necessary winter gear, a new well maintained skidoo, a highly qualified guide, and a memory that will last forever! Want more power? You can upgrade your 380cc Skidoo to a 550cc Skidoo for just a small amount extra. There are other tours such as the High Power Private trip and for more experienced riders – the Extreme Tour! The price is CDN$250 for a full day of action including ALL TAX, some insurance, a BBQ lunch and return transportation from Banff. Include this tour as part of a ski package and save 10% with rocky-peak Holidays, offering ski holidays in Western Canada. Trip Advisor rating of Banff as number one within top ten list for Ski Getaways! ?2. Vail, Colorado, United States? 3. Zermatt, Valais, Swiss Alps? 4. Whistler, British Columbia, Canada? 5. Stowe, Vermont, United States? 6. Mont Tremblant, Quebec, Canada? 7. Jackson, Wyoming, United States? 9. Sun Valley, Idaho, United States? Please leave any comments you have about your experiences in Canada including any tips you might have! We have been turning this blog into a Dog Sled Tour blog with our recent posts so sorry if you are not a dog fan! 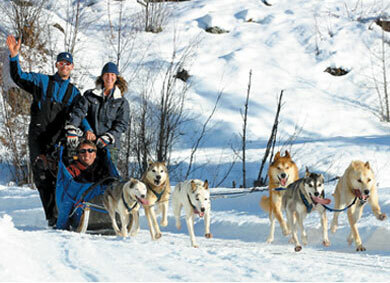 We are just excited about new dog sled tours and want to let you know about them! If you do not want to pay booking fees, and want a one stop dog sled stop for your Ski Holiday package, then contact rocky-peak Ski Holidays. Make the most of your Ski Holiday in Jasper with a Jasper Dog Sled Tour! This tour begins with a 1.25 hour journey along the historic Yellowhead highway to the Small River rest area west of Valemount, BC. 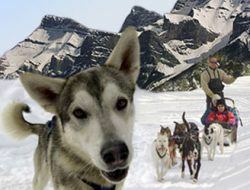 Your experienced guide will teach you how to use the sled and work with the dogs. You will then have the opportunity to drive your own team of sled dogs past snow-covered trees, waterfalls, open meadows and abundant wildlife. For those not wanting to drive, simply snuggle in the sled and soak up the incredible scenery. Enjoy a native-style campfire lunch alongside a mountain stream! The Jasper Dog Sled Tour includes a native-style campfire lunch and hotel pick up and drop off. The tours depart from Jasper daily in the morning and afternoon. Leave about 5 to 6 hours for a round trip. The price is CDN$215 for an adult and CDN$145 for a child aged 5 to 12 years. Bookings can be made through the Ski Holiday company, rocky-peak Ski Holidays. Mush! Dogsledding is one of Canada’s oldest official sports. For thousands of years, the dog has been an integral part of First Nations life. Learn about this ancient mode of transportation as you blaze through the meandering forest of towering Western Hemlocks and Cedars. Witness stunning views of the Whistler Valley, Olympic sites, Black Tusk and beyond as the enchanted forest trails open up to reveal a spectacular world of winter beauty. Your adventure isn’t over until you’ve warmed your hands and shared your tales of adventure over a hot drink and a snack in our staging area! Rates for a round-trip (including transportation) 2-2.5 hour tour are CDN$167 for an adult (2 adults per sled) and half price for children when sharing with 2 adults. To book this tour in Whistler, contact rocky-peak Ski Holidays of visit their Whistler Dog Sled Tours web page for more information. To book a Banff winter wildlife tour, or to include it in an existing package, contact rocky-peak Ski Holidays.